A commission. When God makes us a promise, we can be confident He will deliver, impossible though it may seem. The Bible is full of notable examples of this, and every day our real lives are full of less obvious but no less significant instances. Difficult and painful though our present circumstances may be, we can look to God with the hope that He will keep all his promises and fix all things that are broken; even us. The commissioner for this piece chose the scripture, character, and pose. For those unfamiliar, this creature is known as a sergal, which is a fictitious alien species resembling something like a cross between a shark and a rabbit or kangaroo. The choice in species doesn't have anything, in particular, to do with the chosen scripture; simply a stylistic choice. At first glance, the idea that we must study for ourselves to receive wisdom may seem at odds with the principle of trusting in God to grant us the answers we seek. However, throughout the scriptures, we find reminders that we need to also put in the effort of finding what it is we're looking for. We must "prove all things" (1 Thessalonians 5:21), we must ask, seek, and knock (Matthew 7:7), we must "meditate... day and night" (Joshua 1:8). God has given us the ability to think, to study, and to reason. He expects us to exercise those abilities and to increase them through careful and deliberate use. 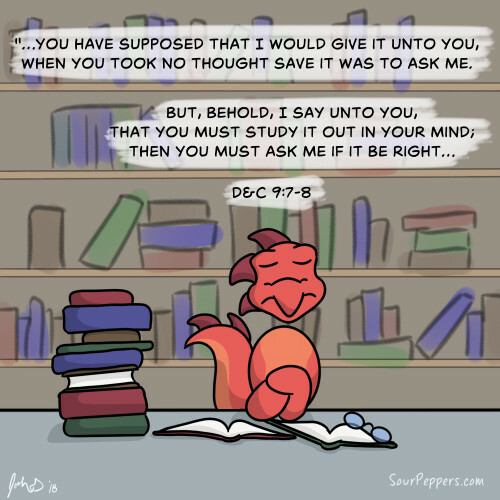 That's not to say we need to be scholars in order to receive revelation from God. But we should make use of whatever faculties and resources are available to us, given our own unique situation and circumstance. Of course, if we rely solely on our own faculties to find the answers we seek, we will either fail, or we will lack the surety of the truthfulness of the answers we receive. Which is why we must pray to God to ask Him if what we have found is correct. These two pieces--study and prayer--are crucial and synergistic. If we neglect either one, we may not find what we seek. However, when we do both, our ability to find answers will be increased in a virtuous cycle: our prayers will be more purposeful and focused, and we will be blessed with confidence and direction in our studies. This is the fourth in a series of Sour Peppers on personal revelation. 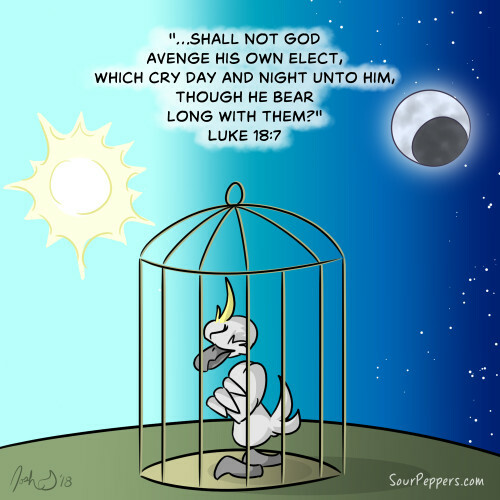 This question follows the Lord's parable of the unjust judge, who agreed to avenge a widow of her adversary, not because he cared about her or her well being, but rather because she kept asking for his help and he didn't want her bothering him anymore. The implication being, if the unjust judge would help the widow because of her persistence, how much more will God, who loves us, grant our righteous desires if we will be patient and persist in prayer unto him and if it be His will. While this verse can apply to any righteous desire that we have, it is of particular importance when seeking knowledge in the form of personal revelation. We may not receive our answers right away. That's okay. Sometimes (often in fact) we will need to be patient. But while we are waiting to receive our answer, we should continue in earnest prayer, which will demonstrate to our Heavenly Father that the knowledge we seek is important to us, and that we trust that He is able to provide it unto us. This is the third in a series of Sour Peppers on personal revelation. 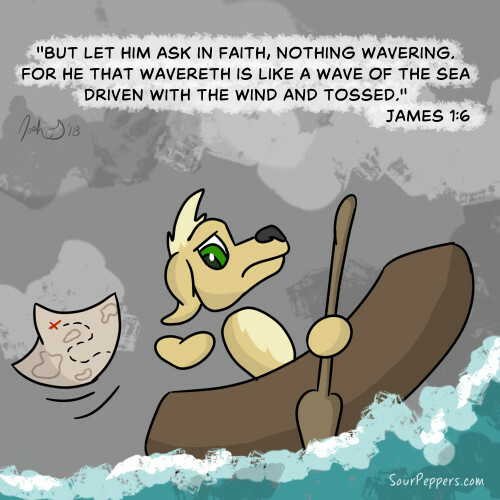 Somewhat less well-known than the verse immediately preceding it, James 1:6 reminds us that when we ask God for wisdom, we must ask in faith. Remember that faith is a principle of action. In other words, to receive wisdom from God, we must be willing to act on the wisdom we receive. To do otherwise would be like asking an expert navigator for a map to get us through waters we've never traveled before, and then throwing the map away, instead allowing the ever changing winds and currents to take us wherever they will. God is not likely to answer a question asked out of mere curiosity, or motivated only by a desire to confirm what we already believe. But when we humble ourselves enough to acknowledge that He knows the correct path better than we do, and when we are willing to accept whatever answer He gives us (even if the answer is unexpected or unwanted), we may pray for wisdom, confident that the answer we receive will be His will. This is the second in a series of Sour Peppers on personal revelation. If we lack wisdom (that is, if we don't know the answer to an important question or problem) we can ask God. 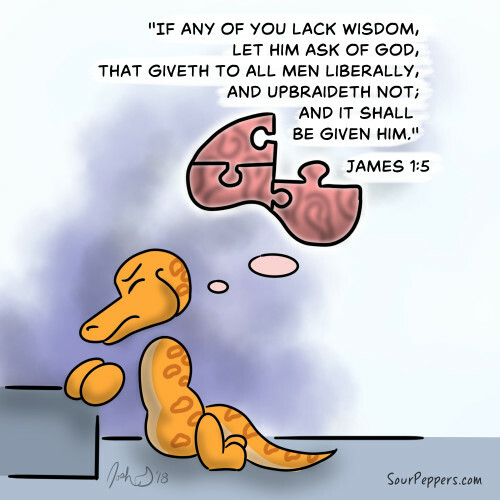 God gives wisdom to all, liberally (in great abundance). God does not upbraid, meaning He does not punish us for asking Him sincere questions. Those who ask for wisdom will receive it. We may need to be patient, but answers will come. Joseph received his answer, and we can too. If there is a problem in your life, and worldly wisdom has failed to bring you a satisfactory solution, try going to the Source of all truth: our Heavenly Father, Himself. In the middle of Jacob's sermon to his people, he rebuked them for their pride in thinking themselves better than those who were poorer or otherwise less fortunate than they. In the middle of his stinging words we encounter this phrase, which serves as a chastisement to the wicked, but also a comfort to those who may feel forgotten or cast out. Society may look at some with a critical eye; those who are not beautiful, rich, educated, or simply normal enough. But remember that God loves all His children equally. Every one of His children is precious to Him. We ought to remember the Golden Rule and treat them as such: the way we would want to be treated, and the way we know God would treat us. This is my second Sour Peppers commission. 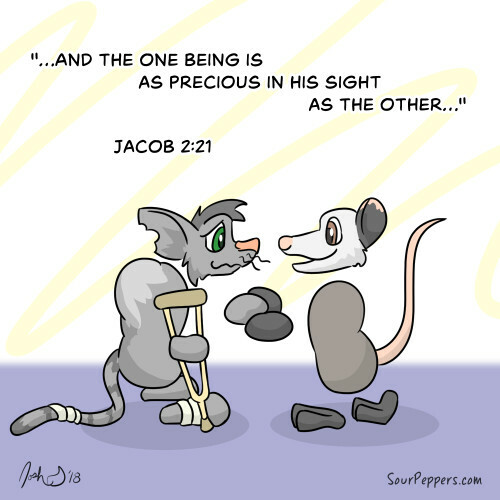 If you would like a scripture or other inspirational quote illustrated similar to the one above, check out my commissions page. Thousands of years ago, a man wrote these words on a cloth that he affixed to a pole. It has since come to be known as the "Title of Liberty." There were those in the land who sought to take their freedom away. There were also those who should have been allies to the cause of freedom, but who refused to defend their country, hoping to benefit from the political turmoil that would result if their enemies succeeded in overthrowing the government. Moroni--the man who erected the Title of Liberty--reminded his countryman of the things they held dear; things that were worth protecting and fighting for. Things far to dear to be given away, let alone for something so cheap as spite or the chance to gain power. There are influences in the world today that threaten to take away our own liberties. We mustn't be fooled into thinking those influences come from only one person, political party, country, etc. 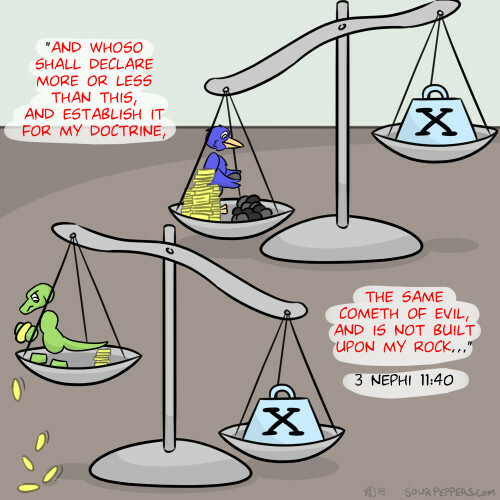 It is often tempting to trade principles of liberty, fairness, compassion, and loyalty for personal or political gain. But remember the things our ancestors fought for, and remember that they still need defending. Happy Independence Day! 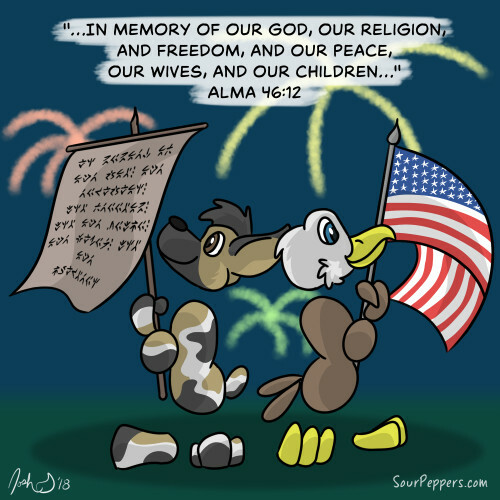 It may be an "American-centric" holiday, but independence from any influence that would seek to limit our liberty is worth striving for and celebrating, no matter where one may live. 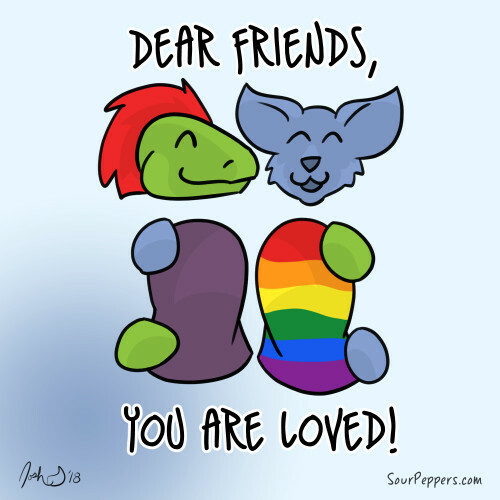 I love my LGBT+ friends and family. We don't always see eye to eye; we have some differences of opinion regarding the politics and morality of LGBT+ issues. But I admire everyone who is doing the best they know how to do what's right, even when that leads them to believe and act differently than me. I also believe that God is merciful, and will take each person's sincere desires to do good into account. I love you and I know that God loves you. If you'd like, you can add the sticker pack that includes this sticker by clicking here. However, drumming up extra traffic for my webcomic wasn't my intention. I didn't want to inadvertently take advantage of Pride Month for my own benefit. Which is why I shared this with some of my friends only at first, and am now sharing it publicly in July. I don't know if that's just me thinking too hard or worrying too much, but there you have it. 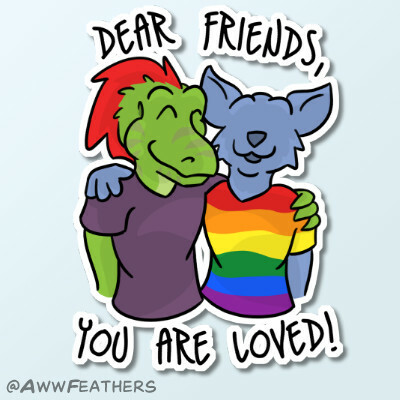 I wanted to do something to show my love for those who are LGBT+, regardless of any difference in lifestyle, belief, etc. Obviously I hope my words and actions in real life and online are more than adequate to communicate my love. Still, I hope this token shows that I do care. My first Sour Peppers commission! If you'd like to commission me to make a Sour Peppers entry to your specifications, check out my commissions page here. Sometimes we are commanded to do things that may not seem to make sense according to our limited understanding. They may even be difficult or require sacrifice in order to do them. But we should remember that God knows all things. He knows how life will play out. Which is why we should listen when He speaks to us, and follow His guidance. It may be that He is helping us prepare for something bad that we don't know is coming. Or there may be an unseen reward later on. Mormon for example, the one writing this passage, was commanded to include the smaller record of Nephi to his abridgment. He may not have understood why, especially since the record of Lehi apparently included much of the same material. But it turned out to be a good thing that he did since the book of Lehi was lost. We are indebted to him for heeding the whisperings of the Spirit so that we have access to the many lessons taught by Nephi and his brethren. And of course, we are indebted to God for inspiring him to include the record. We should all likewise heed the promptings received from the Spirit, even when we don't understand why. As fathers, we have a responsibility to teach our children correct principles. If we do, we will equip them for the time when they have children of their own. 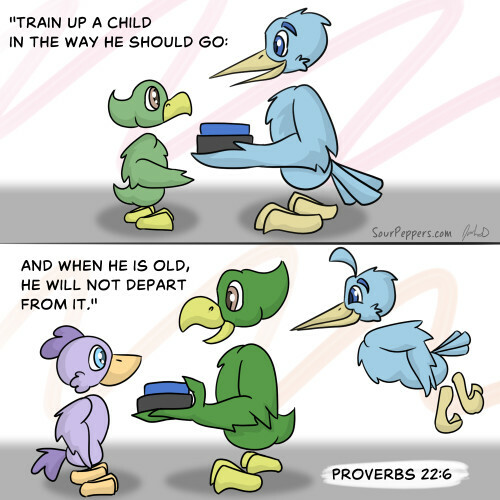 Some have asked, why does this passage say our children "will not depart from" the things we teach them? Are we depriving them of their agency by teaching them the Gospel or other things we believe to be true? I don't think so. However, I do believe that it means when we teach our children the Gospel, it will stay with them, even if they wander away from it. The choice will need to be their own, but the opportunity to return will always be open to them if we do our duty as parents and teach them by word and by example. 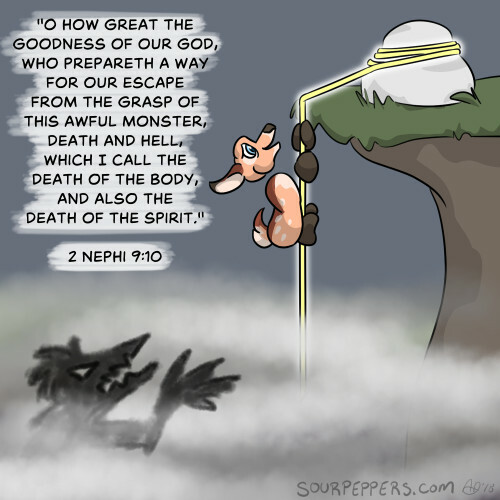 Death and Hell--or Physical Death and Spiritual Death--are very aptly compared to a terrible monster, which we cannot hope to escape on our own. Thankfully, God prepared a way for us to escape. It is only through His Son, Jesus Christ, that we are able to escape. Because He laid down his life and took it up again, all mankind will be Resurrected one day; physical death will be conquered, and will have claim over us for only a short time before we too will be resurrected, our bodies perfected and reunited with our spirits, never to be parted again. Because He took upon Himself the sins and pains of the entire world in the Garden of Gethsemane, the Way has been prepared for our liberation from spiritual death as well. All we need to do is take hold, and not let go. Is it better to be sincerely in error, or to be lukewarm about the truth? One of Christ's biggest criticisms of the Pharisees and other self-righteous, non-believing Jews at the time was that they knew the Law of God, and yet they were complacent. The felt superior to other nations because of their knowledge of the things of God. And yet Jesus hinted that the heathen nations and even the likes of Sodom and Gomorrah would fare better than they (see for example Matthew 11:23-24). How often do those of us who know the truth of the Gospel leave our swords sheathed and unused, while those who are in error only because they know not where to find the truth (D&C 123:12) energetically proclaim and defend their own beliefs? How often do we think we are better than they, for the simple reason that we have learned and accepted the Gospel? And yet we know that God looketh on the heart (1 Samuel 16:7). We've seen evidence of those who were zealous about things which were not true, and then upon learning their error, promptly repented and then were just as--if not more--zealous about the truth (Saul turned Paul is one of the most dramatic examples of this). Furthermore, we know that the dead who would have accepted the Gospel if they'd been permitted to tarry on this earth will be heirs of the Kingdom just as if they had done so (D&C 137:7). And that, of course, is only up to God, who will be the perfect Judge of the thoughts and intents of all men and women, according to the knowledge they received on this earth. It is the duty of every person to do what they can to discover the truth, and then act according to whatever knowledge they have received. The everlasting Mercy of God, afforded to us by the Atonement of Christ, will make up for our deficiencies. But not if we are lukewarm and indifferent about that knowledge. Does that sound harsh? This dire warning matches the fate of the rich man in Jesus' parable in Luke 16:19-31. Many have pointed out that our world is "overpopulated." And that may be true for our current rate of consumption. But we have it on the authority of the One who created this earth that it was prepared with more than enough to take care of all of the earth's inhabitants. The problem is not the earth's capacity to produce. Rather, it is our willingness to sacrifice and share. There isn't a single person among us who can't give something, no matter how meager, to help uplift the poor and the needy of our community and the world at large. It may mean the occasional sacrifice of the things we've come to enjoy and the great abundance with which we have been blessed. But the outcome for doing so is always worth so much more than the cost. GM: The enormous shadow monster begins terrorizing the village, gobbling down the fleeing populace, wrecking buildings, and sowing death, destruction, and chaos. Roll initiative. GM: All right, you guys move first. Paladin: I draw my sword and charge up to the--! Knight: Whoa, whoa, wait. 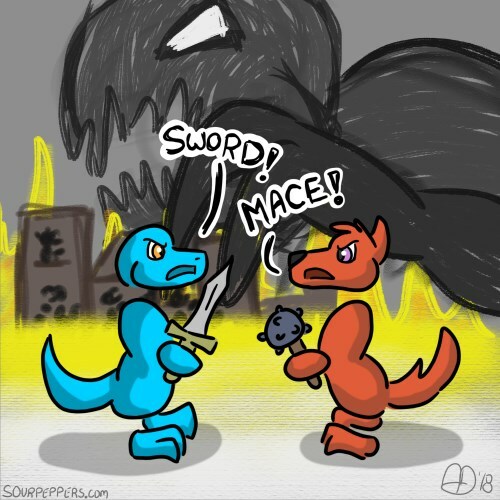 You should let me use my mace instead. Knight: Because my mace does more damage. Paladin: But my sword has a higher chance of dealing a critical! Knight: We need to take this thing down hard and fast! We can't just rely on scoring a few lucky shots. Paladin: News flash! We're using dice! All our shots are lucky! Paladin: Besides, this is probably going to be a long battle. In the long run, I'll deal more damage on average. Knight: Oh yeah? Have you checked your math on that? Knight: Fine! You got a calculator? Knight: Wait, what are you doing? GM: The monster takes another swipe, knocking over more buildings. Screams of pain and terror split the night sky. Paladin: Wait, stop! It's still our turn! GM: You took too long, so the monster took its turn. Now, are you going to make a move? Knight: Fine! You going to let me use my mace, or is your pride going to cost us even more lives? Paladin: My pride?! You were the one who--!! Knight: Besides, a mace is probably more effective anyway. It might have a resistance to slashing damage. Paladin: How could you possibly know that?! Knight: How do you know it isn't? For all you know, you could end up making things worse! Paladin: Oh, for the--!! Forget it. I'm attacking. I draw my sword and--! Knight: I step in front of him and parry his sword with my mace. GM: You guys are on the same--! GM: Sigh... *dice rolling* The monster takes yet another swipe. More innocent lives lost. Now what do you do? Paladin: That's it. I'm attacking! Paladin: Not the monster. Him! Paladin: As long as he keeps interfering, that monster's going to keep killing! GM: The monster is already killing! Knight: Fine! All I wanted to do was take a minute to size up our enemy and make sure we do this right! But since getting your way is clearly more important to you--! GM: Why don't you just both attack the thing?! Knight: No, he'll probably get in the way and cause more damage. Paladin: There's no place for his arrogance on the battle field! 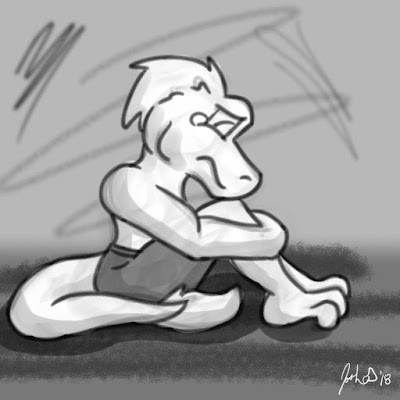 I think the above image is my first time making something even remotely resembling “vent art.” It represents my feelings of vulnerability and insecurity. For those who may not know, this is Ine. He’s a main character from my webcomic, Aww, Feathers! but also represents myself in many ways. 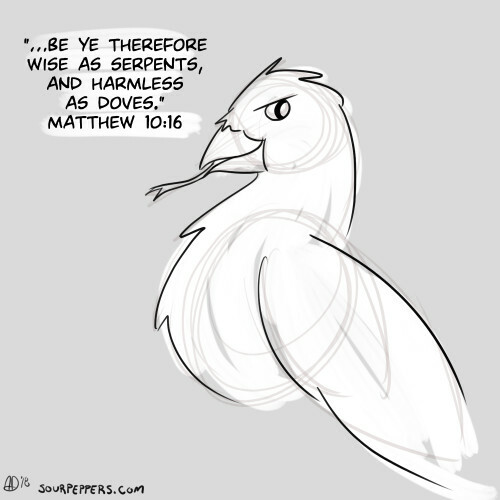 Over on awwfeathers.com I use another character, Lark, to represent myself as the creator of the webcomic. But Ine is still the character who most feels like me. Especially when I’m feeling unsure or afraid. Letting people down. Leaving important things undone. Failing to provide for those who depend on me. Or worst of all, causing harm where I meant to do good. I realized just the other day that those are the things I fear most. The fears that most occupy my mind. It's usually not severe or unremitting. But I feel it often, usually as a dull uneasiness in the back of my mind, and occasionally for brief periods of a more severe form of anxiety. I fear letting my children down, either by losing my temper or by not paying them enough attention or spending enough quality time with them. I fear letting my wife down, either by demanding too much or giving too little. I don't really fear death; at least, it doesn't occupy my thoughts (though my nightmares are sometimes another story). Rather, I fear leaving my family behind before they're ready for me to go, and before I’ve prepared a safe and comfortable future for them. I fear letting my job down. They've been good to me. I don't always agree with their decisions, but that seems barely worth mentioning; in a company of over 400 employees (or is it 500 now?) I can't expect to be the one that's perfectly happy with everything that happens. Moreover, it's apparent they care about their customers, their employees, and even their employees’ families. I want to do the work that's expected of me and help the company to thrive. I want to be an excellent employee, but fear that I sometimes fall short of that mark. I fear letting the readers of my webcomic down. Aww, Feathers! started as a passion project. Even if I never made a nickel from it, I would still do it, because it's been a fun and even personal journey for both myself and my wife. But over time it's evolved into more. 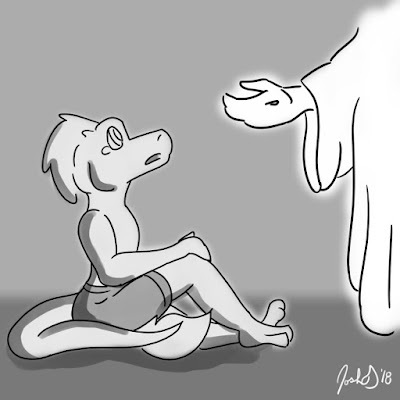 I've received compliments from a significant number of readers who find it entertaining, touching, refreshingly down-to-earth, and also clean; the fact that I'm committed to making a family friendly furry comic is of particular importance to many readers. I worry about the quality of my work sometimes, but not much. I've seen enough improvements in my art and writing skills to believe that that problem will take care of itself in time. But it's the "time" part that worries me. I fear letting readers down by not being able to update it as often as I’d like. It makes me happy to think that something I've created is a legitimately positive part of somebody's life. But I fear not being able to continue to deliver that due to time constraints. I fear letting my friends down. I want to be there for my friends when they struggle. I want to listen and understand and give sound advice when it's asked for. But what if I'm not able to be there at the moment they need me most? What if I give the wrong advice? What if they catch me in a moment of weakness, and I do or say the wrong thing and it ends up hurting them or our friendship? How many times has that already happened with old friends I never hear from anymore? I even fear letting myself down. I have hopes and dreams for myself too. I want to be self-employed someday, using technology in interesting ways (apps and games especially, but comics and other digital art as well) to tell stories that positively impact those who experience them. I would also love to have more time to myself to just read, play games, or do other things I enjoy simply because I enjoy them. I can't help feeling a little selfish in those desires though, which feeds right back into my fear of letting others down. Most distressing of all... I sometimes fear letting God down. In "A Grief Observed," C.S. Lewis says (I'm paraphrasing) that we never know how strong our beliefs are until they become a matter of life and death. I believe in God, I believe in the Church of Jesus Christ of Latter Day Saints, and I believe in the teachings of the Church. But while those beliefs have been tested from time to time, I don't think those tests have ever reached the level that C.S. Lewis describes. When I stare down into the throat of hell and God tells me to jump, trusting that He will catch me... will I jump? I've been hesitant to put these thoughts down, to make myself "emotionally naked" in front of anyone who reads them. Not so much out of shame. Rather, once again, I don't want to let people down. I'm supposed to be strong, a city on a hill, a light on a candlestick (Matthew 5:14-15). Does it worry others to hear about my insecurities? Does it make them question my strength or integrity? The stupid irony of all this is that obsessing over my fear of letting people down actually makes me more likely to let them down. On top of that, I know that many of these fears are irrational. I know that I have many wonderful friends and family who support and stand by me, and an amazing wife who loves me in spite of my weaknesses. Still, it doesn't make the fear feel less real. But then what do I do with it? What can I do with it? We’ve been commanded to “be not afraid,” (Mark 5:36, for example) and I believe that God always provides a way to obey His commandments (1 Nephi 3:7). How then can I overcome this fear of letting people down? Once I recognized and identified the fear, the above words came so easily, like a dam finally breaking. But along with those thoughts and emotions there was a single phrase: “love casteth out fear.” As soon as I could, I searched for those words, and found them in 1 John 4:18: “There is no fear in love; but perfect love casteth out fear…” I felt some hope and reassurance from those words. Unlike the ease with which the torrent of words about my greatest fears came however, I’ve had to go looking and soul searching to find the ways in which love can cast out those fears. But I did find them. And when I did, I felt better about sharing my thoughts. I love my God. And I know He loves me. He already knows my fears and my weaknesses. He wants me to be constantly improving myself. But He is also infinitely patient. He knows when I’m doing the best I know how, and takes my honest intentions into account. He may yet require difficult things from me. But I love Him and trust Him. Because of that, I am confident that, though I may stumble, I will eventually rise to whatever challenge comes my way. I love myself. I’ve come a long way. I’m so grateful for the progress I’ve made and for the things I’ve been able to accomplish. Not that I wish to boast of my own accomplishments; I don’t consider myself any better than anybody else. Nor do I want to become complacent. But as I seek to continue to grow and improve, I will acknowledge my successes at least as much as my failures and will thank God for them. I will allow myself to take part in wholesome recreation and set aside time for it, because it’s important in its own right. I will exercise moderation in the type and amount of entertainment I consume, but I will allow myself to enjoy it without feeling guilty for it. I also won’t give up on my dream of self-employment. That will likely be a long journey, but I’m game to try. I love my friends. Over time I’ve developed the ability to listen and empathise, and I will continue to develop and utilize that gift. When asked for advice or answers to difficult questions, I will respond to the best of my ability, but I will also be humble enough to acknowledge my own limited understanding and point them to someone who can serve them better, such as a doctor, counselor, or other professional, their parents, religious leaders, or God. I love Aww, Feathers! It’s important enough to me that I’ve sought God’s guidance on how to proceed with it on multiple occasions, and I’ve felt that it is a project that I should continue. I’m glad that I’ve done so, in spite of the challenge it has been. I’ve seen good things come from it, and I’ve got plenty more plans for it. I have wonderful fans who have been understanding when I’ve occasionally had to delay a new page. Though I’ve also tried to reward their patience with something small but fun. I’ll continue to update the story, but I will also seek a good balance so that it doesn’t drain every remaining drop of my energy and free time, as it occasionally has in the past. I love my job. I love the people I work with. And I love the children that our product serves. I enjoy programming very much. I sometimes wish I could be programming different things, but there are still fun and interesting things to do at my work. I know I’m a good programmer. I’ve received many compliments at work, and the results of my work also speak for themselves. It is sometimes a challenge to stay focused on the job, but I’ve been getting better at that. I’ll take short breaks throughout the day to stay fresh, and then when I’m supposed to be working, I will work diligently and continue to show my employers that I am a valuable part of the company. I loved Jakiro while she was with us, and love the memories we have of her. I did my best to prepare a safe and comfortable home for her and to keep it clean and to feed her right. I know I made some mistakes in my care for her. But it wasn’t for lack of wanting and really trying to do the right thing, even at significant expense of time and money. And besides that, the vet strongly suspects she had been sick for a long time without us knowing, maybe even from the day we first got her. There’s no way to know if I could have done anything different. But I do know I cared about her. And I love and care about all of God’s creatures. If I were to get another, I know I would love them too and do my best to take care of them. I love my wife and my children. That love motivates me to become a better husband and father. I quickly recognize and seek forgiveness for my mistakes--a habit I learned from my own earthly father. And I know that my wife loves me, not just in spite of my weaknesses, but because I’ve been willing to share them with her and to be exposed and vulnerable in front of her. I enjoy spending time with my wife and each of my children, and will try to regularly set aside time for them, together and individually. I still fear letting people down. But I’m determined not to let that fear control me or paralyze me. I know I will let people down, in spite of my best efforts, because I am imperfect. But I also love people. It’s easy for me to love. So I will allow that love into my heart at the times I feel afraid, and let that love motivate me to do what I can, and leave the rest in God’s more than capable hands. If the image above was my way of venting feelings of anxiety and vulnerability, the one below is an expression of hope and gratitude. Like me, Ine experiences moments of fear and doubt, but also times of clarity and peace. 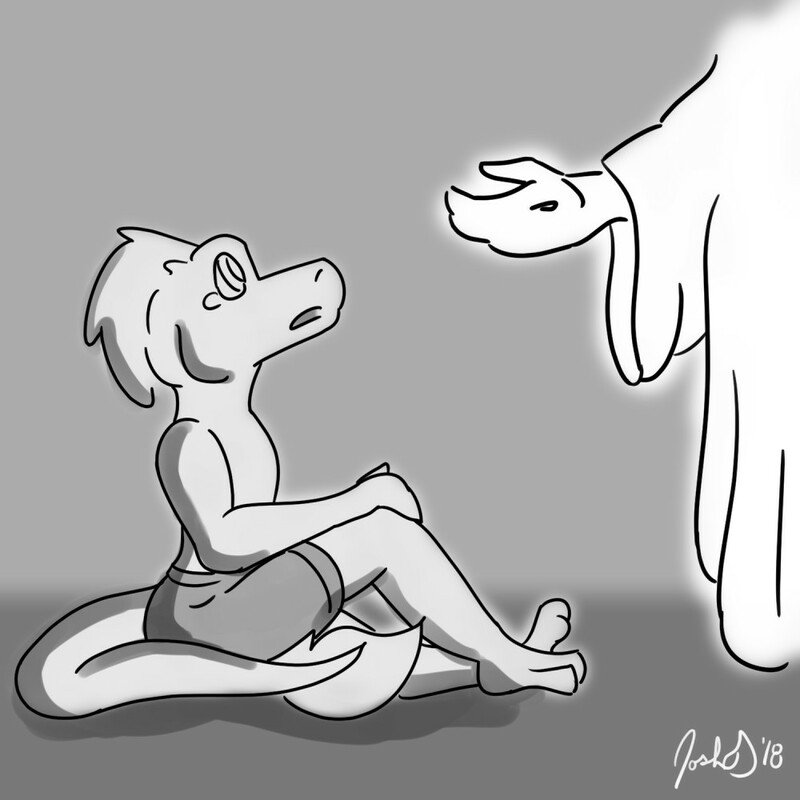 It’s oddly fitting that my first piece of “vent art” is accompanied by my first attempt at depicting the Savior (that I can recall, anyway). I believe it is because of Him that I can overcome fear and weakness. “I can do all things through Christ which strengtheneth me” (Philippians 4:13). We are blessed to have the Gospel of Jesus Christ, which is the only way we can overcome the effects of this fallen existence and achieve lasting happiness. However, we are sometimes guilty of not accepting that precious gift as it is. How often do we sometimes pick and choose which parts of the Gospel we will focus on, or which of God's commandments we will obey, while discarding or at least neglecting the rest? Or how often do we add our own opinions, traditions, and ideologies, elevating them to the point where we give them the same level of importance, if not more? When we do these things, we are not living the Gospel the way God intended, and we fall short of our potential. Every piece of the revealed Gospel is of great value to us, especially the pieces that may be the most difficult for us to understand or accept. And while our own opinions and traditions may not necessarily be "evil," they can distract us from the truth and cause us to look "beyond the mark" (Jacob 4:14).